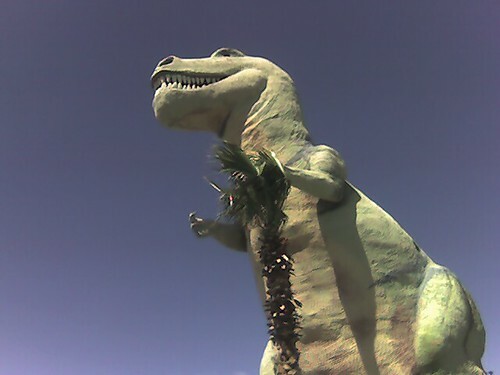 The other day we drove a few hours east on the 10 today and found the dinosaurs from Pee Wee’s Big Adventure. Here’s a buncha photos I snapped while we were there. We were excited when we found you could still go in them, and then freaked out when we found out they’d been taken over by creationists. Although the displays of medieval knights fighting dinosaurs to illustrate the point were pretty fantastic. And while they might be throwing science out the window, they sure have no problem with commerce as you can buy all the toys displayed and make your own evolution bashing diorama at home. And in case you need more, here’s their official website. Wow – creationists running the dinos? An interesting tidbit from the site…. Even the simplest living cell is an incredibly complex machine. It must be capable of detecting malfunctions, repairing itself, and making copies of itself. Man has never succeeded in building a machine capable of these same functions. Yet most scientists accept the belief that life arose from non-life (in spite of the evidence clearly indicating that it did not and could not happen). This incredible belief is as absurd as the finding a complex chemical manufacturing facility on Mars and assuming that it built itself. Unreal! So the idea of an unknown designer makes sense(cents in this case). Gimme a break!! Ahh!!! You know, that’s the second time Pee Wee Herman has come up today. The first time was at a meeting at the Fontana City Hall. Tell me you ate at Wheel Inn. Cause if you’re gonna stop at the dinosaur truck stop, you’ve gotta eat at Wheel Inn. And enjoy the great art for sale on the walls of the restaurant. I need to dig up the photo of the light-up last supper that I took when my wife and I stopped there last year. Driving past this a few years ago, my hubby and I almost had a heart attack! We LOVED that place and were freaking out at everyone around us, and it seemed like no one understood the Pee Wee significance. And then, yeah, we discovered the bizarre intelligent design angle to the gift shop. That was weird. TELL EM LARGE MARGE SENT YA! AH HAHAHAHAHH! “A worldwide water catastrophe.” WTF??? Next PostNext we like the cars. the cars that go boom.